I don't see "Raise the Land" and "Return to the Old World" in your lists at all. They are in the sheet you can find them in factionless "ReturnRift to the old World" and in GI "RaiseCleanse the Land"
I recommend picking up one of these if you get the chance but not more then one. For more of them you pick up recycle. Hellmouth is pure card value AND circumvents the lone keep. Why do you only rate it average? It is value yes but it also is slow like breaders and dragon project and that makes it average but i have to reconsider Aleta and summoning stone. I dont want to sound rude but is that a troll? I also wonder why One of Many is considered THE best common card. One of many is the best 3 coast vanilla in value. There are not many 3 drop than can stand up to them with two of them are rare and only one that survives the fight. After Infestation I was thinking about puting them down 1 rank because of the enraged hulker but after some games I came to the conclusion that they still deserve there spot. The hulkers are better lategame drops but on turn 3 or 2 with ramp the manys dominate the battlefield. In the end you want to have your warpath deck to have a balanced curve on 3 4 and 5 with options. Thats why a lot of the beasts are clumbed up in the average spot. The are all decent picks and all do there job very well for the cost. rare and above cards are kind of hard to rate. The are either realy realy good like SKRAAR and Deamon of Fear or realy realy bad like Bloodbath or the egg and some are just okay. Average cards are by no means bad and you can pick them up but would you pick it over a SKRAAR? I dont think so. Splitter gets puffy done on its own Lucca needs a setup (its easy to create but still does need it) and to get the same value out of her she needs 3,5 artificals on the board. The spltter is also a better tempo play early on. on the other hand Luccas impact at later turns can be devestating. I agree that Lucca is one of the best cards you can draft in a GI deck but splitters are the best cards in draft. Yes I need to put them down to avarage maybe even below. At the time I made this sheet I havent played with all Infestation cards and I know better now. The setup they need is to hard to create in draft relaiably and they are expensive for the stats they have. Like you said, after Splitters and Luccas they are decent picks and thats average. I like picking up one too, if i get the chance to. Shikana is an expensive double edge sword and often ends up to be a dead draw. You will find something better to pick I am sure. In draft, you have to ask yourself, "Can this card break a stalemate?" (Stalemate=when the number of blockers is equal or greater than the number of attackers and neither player is making progress. This is why flying and, to a lesser extent, unstoppable, is really great in draft.) Flying breaks stalemates. This is why Hellmouth and Dragon Project are good. Hellmouth on an empty board is generally gg. Dragon Project is slower, but also when you both players are durdling (i.e., stalemate situation), you can keep playing out your blockers and you can charge it up. It's excellent in a control deck as well, especially since it's only 1 purity. You do need the right type of deck for it though. If you're going for Constructors, then skip it. If you're not, then it'll be really good. Drgaon project is imo a strait "win more" card. I never saw a dragon project win a single game in draft. Hellmouth can do decent but like you said you normaly want the keep over it. It's card you can pick up and when it gets rolling it can win the game yes but that comes with the downeside of a lose in tempo. It's a decent card but Deamon of Fear and mass death are the overall better cards in the rare slot. I am thinking about promoteing it to good. I was bussy with my birthday so i did not had rhe time to do all the updates on the sheets. If it is okay with you i would intigrate this in the 1# post and ofc give you the credits for it. I also would make the update on your sheet too, if you give me excess to it. Thanks Here is a link to the spreadsheet Just make your own copy if you want to edit it. I personally hide Columns A-F and Rows 4-110, So I just have the 4 choices to choose from instead of searching through the table. Updates and all that jazz. No problem, if you need some help, just let me know. Just going to add links to 2 real-time (or closest that can be done in regards to posting it up on a forum) draft runs that help get in the mindset of what cards are picked and why. Great guide. It is much appreciated. I have yet to try Rift runs because they are so intimidating. Since CoV is so strong, would you pick an average/bad commander just to get their spells? I've had some success with CoV, Warpath and my 15 wins was G.I/CoV with 2 Splitter bots and a ton of flying. Flamedawn hasn't been working too well for me so far. What factions are good combos? How viable are DoD/morale in draft? I have fantastic runs most the time with GI/FD, CoV/FD, GI/CoV/FD. I've done solidly with FD/Sleepers and lately DoD/CoV has turned out fairly well for me. DoD is still a little UP imo. There total lack in removal on 1 purity is there biggest downfall. A well placed disarm can work wonders and the ghosts are kind of good removal but also need to hit the "right" target. On 2 purity DoD has Xi, eagel-eye and the stone witch help a lot and like Chaosangel2112 mentioned CoV makes up for the lack in removal and it can work out pretty well. FD is a double edged sword in draft. FD tends to fast games. Expecially with direct dmg and magic syphoners of CoV. So if you look for the fast grind thats the way to go but you probably dont go 20+ wins with an FD havey draft because the lack in lategame options. 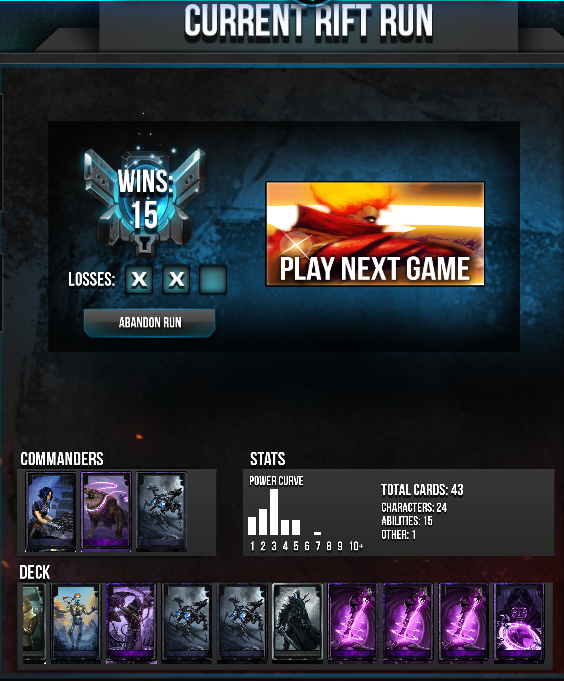 Your 15 win deck has 2 of the best components of a GI draft for command. Tinkerer is the enabler for GI since she lets fodders and infected drones become threats and the splitter is agruably the best 4 drop in the game. GI lacks in good removal which the normaly make up for with very efficient. units. Haveing CoV to back them up in this matter still helps. If you only have bad/medicore commander choices, I would rather pick a CoV one then a DoD one but there is a lot more to take into acount. You find some combos in the guide if you click the adorabears proven combos link. The ai is the lowest common denominator. Would someone mind updating the tables with Ascension? Thanks!